We had a great weekend exploring the UK Games Expo this year and wanted to tell you all about our experience. Tamz’ shopping list was completed in record time. 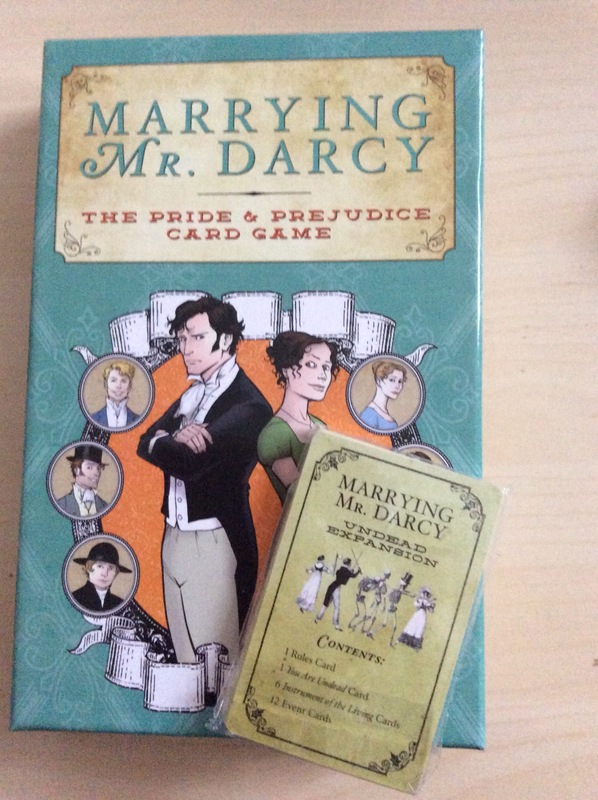 Marrying Mr Darcy was top of the list and found almost immediately! Well, she did purchase the Undead Expansion before the main game in a fit of madness and reeeeeealy wanted to grab the game after missing it twice on Kickstarter! You may or may not remember our new years resolutions – check out the post here Well, we wanted to play at least five games at the Expo this year. The night before Tamz amended that to include at least one oversized game! 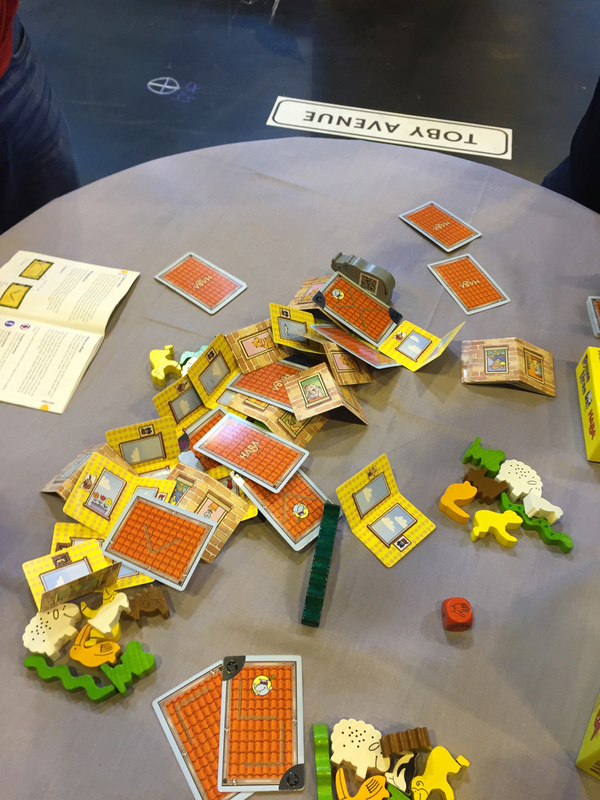 We got stuck straight into playing games when we joined in a game of Rhino Hero at the Haba stand. All fun until Tamz knocked an impressively tall tower over! Mike won though. Wondering past the Days of Wonder play area saw us stop to play a bit of Quadropolis. We did not get on well with this game. Possibly because we were distracted by all the fun around us. So we only played one round. It does have funky plastic blue meeples though! Next up we played a game called Carrotia by Mage Company. Another game that suffered from being played at the expo. Carrotia is a co-operative, tile placement game where the team works together against a timer to build mazes. The rabbit then moves to the exit in a set amount of moves picking up carrots and avoiding mischievous birds. It looked good with some great artwork and was simple enough to play. However our attention was lacking due to being tired from all the Expo fun. If we had the chance Tamz would want to play again in a quieter setting. So the last game we played was an oversized version of Mmm! by Pegasus Spiele. Now this was the perfect game for our brains at this time of day. The lovely lady explaining it to us even used the really simple kids rules. The object is for the mice to eat all the food before the cat turns up to spoil the fun. So you roll the dice and place mice tokens on the food rolled. If you cannot eat a whole item of food on your turn the cat moves forward a space. With the giant foam dice and mahoosive playmat we had a whale of a time chucking things around. Infact by the end we were a bit jelly of the little kids playing the giant version of Yeti next to us, we wanted to play that too! Oh, and we had a fantastic game and beat the dastardly cat! 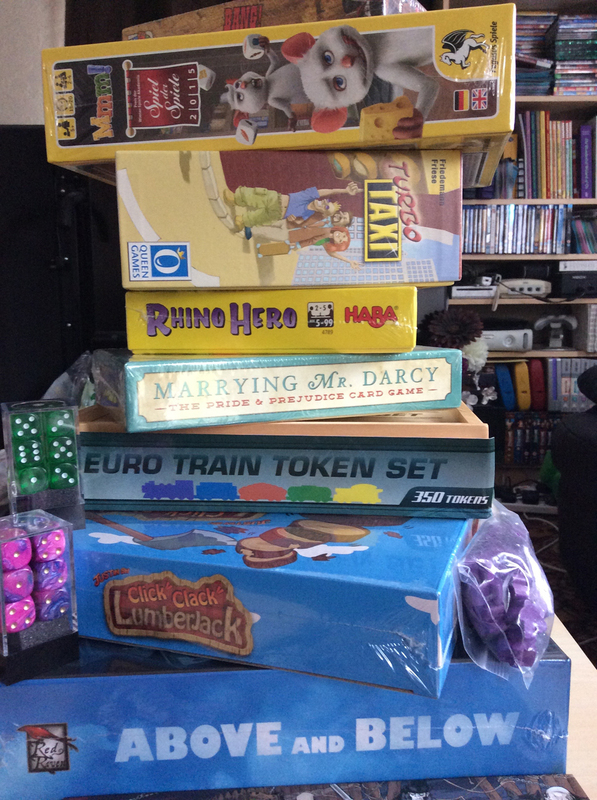 We decided to brave the queues for the Bring and Buy boardgame sale this year. Half an hour standing in line and Tamz spent all of £3, lol. There were a few things that looked good. Ticket to Ride dice expansion, but at £50 it stayed there. We also found quite a few really old and classic games. Mike felt he needed to do a bit more research before going to the Bring and Buy as some games looked interesting but he did not know anything about them. Mike did drool over the Hawk Wargames stand! There was an amazingly big ship all lit up. He does like his Dropzone game. The cosplay was great fun this year. A giant space marine on stilts with a Harley Quinn theme. The usual Doctor Who lot with some Daleks. An orange fish who looked lovely. And a Space Marine from Halo who reminded us of our gaming friend Nick when he flexed his guns at Tamz! We were so happy that the Expo has finally moved over to the exhibition halls. It no longer feels cramped and bursting with people everywhere you go. We spent ages walking through all the stands, taking our time and enjoying everything we saw. We stopped for amazing ice cream and chatted with a few exhibitors. We wanted to play a game of Ghostel as Tamz backed this on Kickstarter. However the stand was busy every time we walked past – a good sign of things to come. So we just settled for playing with the oversized 3D printed ghost meeples – squee, cant wait for the game to turn up now. It was great to see Tom Vasel and Sam Haeley from the Dice Tower at the expo. They also covered the Expo really well on social media getting us super excited the day before. 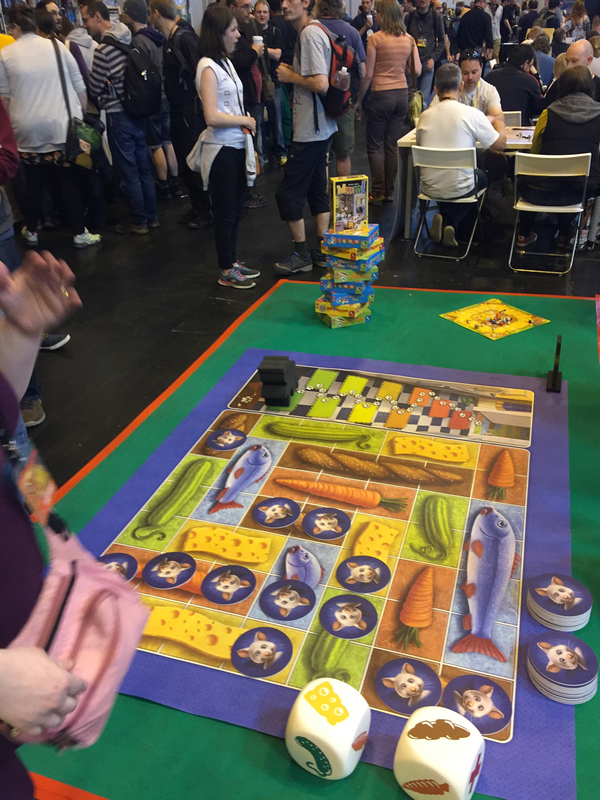 If you have never been to the UK Games Expo and love to play games – GO NEXT YEAR!!! Seriously, it is so much fun. Although you will spend a lot of pennies. We are still scratching our heads over where we are going to fit all the new games purchased! The new games could always go in the new bigger shed which your gonna have to build to put the new bigger table in to play the giant size ticket to ride……….